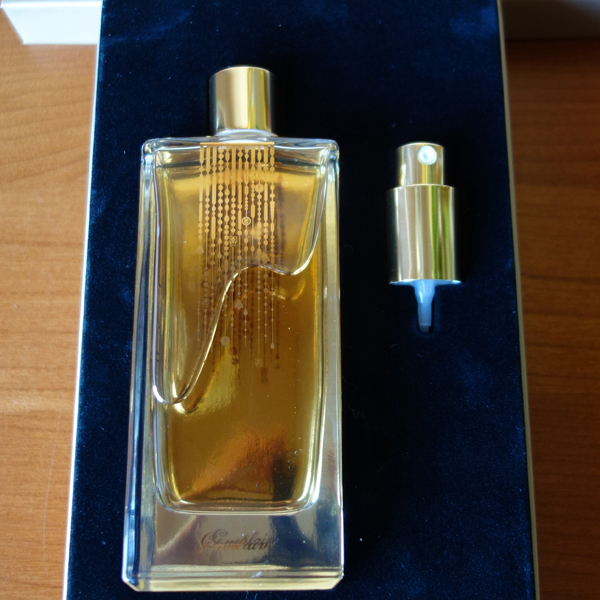 This entry was posted in Favorite Perfumes, Not a Review and tagged Encens Mythique d’Orient, Guerlain. Bookmark the permalink. ← A Postcard from Rusty: Happy Valentine’s Day! Undina! What a fabulous choice for your birthday. HAPPY BIRTHDAY! DNEM but I recently couldn’t make a decision between the encens and the rose in this trio so bought Vol De Nuit. Funny, isn’t it? It is funny, dear Portia. And thank you. Thank you, Steve. You’re in! It sounds delicious. Congratulations on your birthday scent and such a beautiful bottle! I love incense and would love to try it, but couldn’t possibly get something from your birthday bottle. I’d feel far too guilty, so count me out, my sweets. I’m working on my “imposing” issues, but clearly, I need to work harder. LOL. First of all, you might not get it even if you “ask” – it’s a draw (and you’re init ;-P). Next – about Rusty. Here I told a story about Rusty and perfumes. Since then I was watching him closely (since hespends a lot of time on my lap while I’m testing) and I know that there’re some scents that he doesn’t like but I wasn’t able to figure out which ones. Heh, well, I meant “ask” as in asking to be put in the draw. lol. I just cannot believe Rusty loves Opium. I’m blinking in awe over just how amazing that furry child of yours is. OPIUM!!! My God, is that the coolest thing ever or what?! (Vintage) Opium is my ultimate, “Holy Grail” beloved scents. In fact, I just bought a bottle from the 1970s six weeks ago. When I die, I plan to go out in a blaze of Opium. Rusty, oh Rusty, you may just be perfect. No need to include me in the draw, Undina, but congrats!! I smelled the trio in Paris, and this one was my favorite. Even though I didn’t detect much incense in it (maybe I would have if I spent more time with it), I thought it was quite, quite beautiful. Congratulations on your Encens Mythique d’Orient FB, a truly fabulous perfume AND perfume bottle. We have very similar perfume likes! I have a sample of this and I keep going back to it “hoping” that I would not like it much because if I end up LOVING it, it will be Guerlain bottle #4 this year and it’s only February. I am also intrigued by the comment “It smells like a men’s perfume counter at Macy’s” – I think that co-worker needs a nose transplant. That said, I recently discovered that we have a Fragrance Policy in my company! Four bottles of Guerlain in less than two months? Wow. Which ones did you get? With the number of perfumes I own I have no problem taking into the account reasonable likes/dislikes of people around. And I definitely prefer to do it by my own free will before the company starts implementing one of those policies. Actually three so far this year and Encens Mythique d’Orient would be number 4 if I cave in. The other 3: Spiritueuse Double Vanille, Gourmand Coquin and Iris Ganache. As weird as it sounds, the price point I usually dither over is $100$200. Thank you! I really like it. After some further testing of this perfume, I’d have to say it’s my favorite perfume of 2012. Of course, I didn’t try nearly everything that came out in 2012. But I adore it. I’ll try to write about it soon. It was unexpected for me because this perfume was not really what I expected, but it turned out to be so much better than I imagined. So funny to read Olfactoria’s review again – I know I read it at the time but I did not remember it at all! It’s so interesting/amusing how everyone’s taste is so different. I was pleased that somebody guessed it :) Not that it mattered too much – I did purchase it already despite others’ not liking it much – but I was glad that you thought of it as of a possible option. What a great gift to yourself! This is also my favorite of the three and I have been tempted to pick up a bottle of it at Duty Free. I love the smokiness of it although it is not as much as you might think from the name. No need to enter me in the draw I was given quite a few samples recently. Dubaiscents, thank you for the vote for my new perfume love. Aww. my guess was incorrect this time. Anyway, BIG congrats for your new Guerlain perfume. This bottle looks very stylish and attractive. Enjoy every spray of it! You’re in the draw, Lucas. I should say that that those aren’t that easily available here as well. But at least you can get them in your country (I know this sounds funny, USA is HUUUGE). If I wanted to get one I would have to go search abroad. I know what you mean. But, on the other hand, Paris, London and other really great places are much closer to you than to me (and you won’t always be a student ;) ). that’s the other side of the medal. Unfortunately in my country they don’t stock all guerlain perfumes, only the main stream ones :( So I can’t really give my thoughts on this one. However, buying yourself a perfume for your birthday is definitely a good idea – something I should consider doing as oppose to me adding to my ever growing collection. Mel, I should admit that I keep adding perfumes to my collection not only for birthdays (and other worthy events) ;) But for the birthday I try to buy something “big”. It was. Here, in the US, it’s available from Guerlain boutiques and selected Saks and Neiman Marcus stores but not in all. My bottle came from Guerlain Las Vegas. And I forgot to mention in the comment above – you’re in the draw. Good luck! Tara, I know! I was surprised myself. And yes, I’m mostly a floral (maybe with some slight variations) fan. But my tastes progress, I find favorites in all other types of perfumes. I would love to be part of this draw! It isn’t very often that I get to try beautiful Guerlains, even the mainstream ones, where I live. Thank you for your generosity! Brie, you’re in the draw! Perfume availability is a strange thing: without knowing that all that boutique or niche world exists you might never come across it and live thinking that your local mall’s offerings are everything that there is in perfumery. Completely agree!!!! I lived for 30 years in NYC and was completely spoiled in terms of perfume availability. Then I moved to a more rural area and the closest thing to a perfume store is a Sephora which is a 40 minute drive from my house. Yet it is people like you that keep me in the loop on what is new and great…thank you :) !! I can’t even imagine moving out of NYC! I want to try this in the worst way because a girl can never have too much incense. Well, that’s what I tell myself at least. I’m glad you had a great birthday and have a wonderful present to remember it by. Thank you, poodle! You’re in. Of course I think it was a great choice because this was one of my four (measly) selections for best of 2012, but it was a really good perfume and not just another ho hum Guerlain release. Not much justifies a whole bottle-but this does! Bravo, Undina! What a wonderful birthday choice! I must say that I too am surprised. I was certain the pretty blue L’Heure de Nuit was the celebratory choice! In any case, no need to include me in the draw. I can easily try it here in New York. Again, happy birthday! I know that you smell awesome! 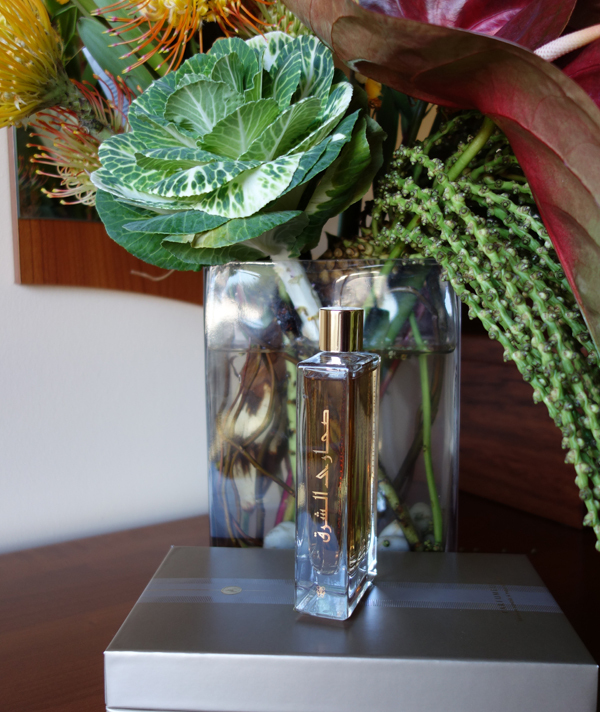 L’Heure de Nuit is a very beautiful bottle and, being a limited edition, is very tempting. Unfortunately, I wasn’t taken by the perfume: unlike the original LHB, this one I can wear but I do not even like it much. I agree: you have to love it, no matter how pretty the bottle, no matter how limited. I have found that there is one phrase that will push me over the edge quickly: “soon to be discontinued”! I think you made a beautiful choice. Happy Birthday again! I know exactly what you mean! I ran and bought Dior’s Mitzah as soon as Portia mentioned it would be discontinued the next month – and I didn’t plan to do it until at least the next Fall! Yes! The same thing happened to me a few days ago but with Etat Libre d’Orange’s Rien! The mere mention of discontinuation had me opening my wallet fast! Btw, have you smelled it? If not, I can send along a little vial of Rien as well! I have a sample of this, thanks, that I got on my visit to “Birgit Heaven” in Belgium, so no need to enter me in the draw. I must get it out and retry it in fact – I think I liked it but was not blown away, ditto by Rose Nacree. The third in the trio – Songe d’un Bois d’Ete – was, however, very animalic – not unlike Yatagan indeed, so that was my least favourite of the three. I have pictures of Rusty with that bouquet (but I didn’t have a bottle then) and by the time I got the perfume the bouquet was in another room where Rusty couldn’t participate. And since there was enough of his pictures in the blog recently I decided not to move flowers. I am testing it again today and it is brighter and “prettier” than I remember, especially for an incense scent. Really enjoying the frankincense in it – it is sweet and almost sherbety – I guess that might be the aldehydes. Yes, I can see why you love it, though for me it is just a big fat like at this point! “Like” is good :) I’ll take your “like”. Does it mean I should add you to the draw for more? You’re in, Irina. Good luck! I haven’t tried this one yet, and am always curious about a new Guerlain. From the photo, I like what Guerlain has done to the bottle. I did try l’Heure de Nuit, and like you, was not taken by it. I think I”m drawn to the more irisy or oriental Guerlains. The bottle looks nice (but it’s really hard to catch on a picture). Good luck in a draw! “like a slightly confused gourmand”? Count me in! :) “Он и меня посчитал!” I mean, done! Undina, Jo Malone Sugar & Spice collection is already available to buy!!!!! By “march” you mean “go and get them all”?